(fyooz) Abbrev. for Far Ultraviolet Spectroscopic Explorer. An electrical safety device inserted in a circuit to prevent overload; excessive current melts a wire inside a fuse, which interrupts the flow. It is no longer functional once this happens, unlike a circuit breaker, which can be reset. a simple device for protecting electric circuits from overloads and short circuits. A fuse consists of one or several fuse links, an insulating body, and terminals for connecting the fuse to an electric circuit. Some fuses are filled with quartz sand to provide better cooling of the fuse link and to quench the arc; some have actuation indicators. Flat fuse links have narrowed sections that melt first. Fuses are series-connected in an electric circuit and break the circuit when the fuse link melts. An expendable device for opening an electric circuit when the current therein becomes excessive, containing a section of conductor which melts when the current through it exceeds a rated value for a definite period of time. Also known as electric fuse. A device with explosive components designed to initiate a train of fire or detonation in an item of ammunition by an action such as hydrostatic pressure, electrical energy, chemical energy, impact, or a combination of these. A nonexplosive device designed to initiate an explosion in an item of ammunition by an action such as continuous or pulsating electromagnetic waves or acceleration. An expendable protective device that eliminates overload on an electric circuit. The fuse is connected in series with the circuit being protected. 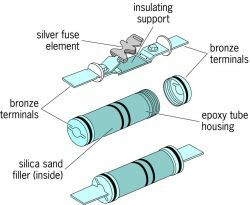 The components of a typical low-voltage high-power fuse are a fuse element or wire, an insulating material support and housing, two metal end fittings, and a filler (see illustration). The fuse element is a silver strip or wire that melts when the current is higher than the rated value. The melting of the wire generates an electric arc. The extinction of this arc interrupts the current and protects the circuit. The fuse element is connected to the metal end fittings which serve as terminals. The filler facilitates the arc extinction. The most commonly used filler is sand, which surrounds the fuse element. When the fuse element melts, the heat of the arc melts the sand near the element. This removes energy from the arc, creating a channel filled with the mixture of melted sand and metal. The metal particles from the melting fuse wire are absorbed by the melted sand. This increases the channel resistance, which leads to the gradual reduction of the current and the extinction of the arc. The insulating support and the tubular housing holds the fuse elements and the filler, which also serves as insulator after the fuse has interrupted the current. The interruption time is the sum of the melting and the arcing time. It is inversely proportional to the current, that is, a higher current melts the wire faster. The fuse operates in a time-current band between maximum interruption time and minimum meeting time. It protects the electric circuit if the fault current is interrupted before the circuit elements are overheated. The arc extinction often generates overvoltages, which produce flashovers and damage. A properly designed fuse operates without overvoltage, which is controlled by the shape of the fuse element and by the filler. An overcurrent protective device consisting of a metal strip, ribbon, or wire which is designed to open an electric circuit by melting if a predetermined current is exceeded. i. A portion of a circuit made of wire with a low melting point that melts and breaks the circuit when the current is above limits. ii. In armaments, an element that activates the ignition train. The fuse may be time-sensitive or height-sensitive, or it may operate on impact or after some time of flight. A DEC software development environment for ULTRIX, offering an integrated toolkit for developing, testing, debugging and maintenance. (1) A protective device that is designed to melt, or blow, when a specified amount of current is passed through it. PROM chips are created as a series of fuses that are selectively blown in order to create the binary patterns of the data or machine language. The four series compensation banks installed by GE will utilize its reliable fuseless capacitor design and will include metal-oxide varistors and triggered air gaps.